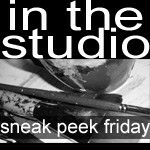 Friday Sneak Peek - Jill Ruth & Co. I thought this stained feed sack needed a tree, and it did. For a while I thought it needed leaves, it didn't. The leaves have since found their way to a bare branch in our foyer. The tree is just going to be pinned up on the wall for awhile. Sometimes a project is just an exercise and that can be a good thing too. I hope you have a great fall weekend! You can peak at other projects here. Ooooh pretty :) I like it! Sometimes a project can just be an exercise which is definitely wonderful. Love your tree on that feed sack. I also love those pretty leaves! 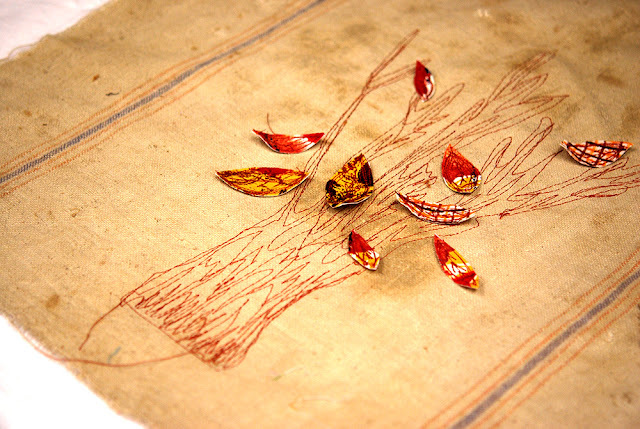 Love the free motion stitching...I like to play with sewing in my mixed media, too, but haven't done much of it lately....maybe just a few leaves? Of the paper made into cloth variety? thank you for joining up with the ladies at studio JRU. Maybe we just don't have the right animals,lol. Your tree with our without leaves is enchanting Jill...I need to get my sewing machine fixed once and for all...very inspiring! I love how you do the stitching... have I told you that? It is GORGEOUS!! !